MOVIE OF THE WEEK January 11, 2019: WHAT IS DEMOCRACY? January 6, 2019 February 3, 2019 Jennifer Merin 0 Comments astra taylor, betsy bozdech, Cate Marquis, documentaries, liz whittemore, loren king, mariyn ferdinand, maryann johanson, sandie angulo chen, Sheila Roberts, what is democracy? 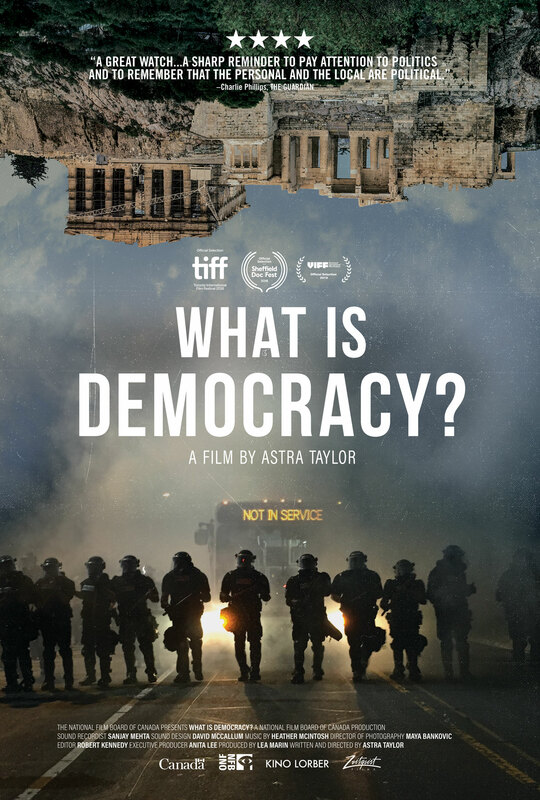 Thought-provoking and philosophical, Astra Taylor’s timely documentary What Is Democracy? takes a deep dive into a topic that many of us probably think we know a lot about. But, as is shown in this compelling film, it turns out that the concept of “democracy” has greater nuance and more room for interpretations than most average citizens (voters or, sadly, non-voters) around the world seem to realize. By interviewing a variety of people about a wide range of subjects — from the political history of ancient Greece to the current state of public education in America — Taylor weaves a fascinating tapestry of impressions, experiences, and opinions related to the notion of self-governance and representative government. Renowned thinkers and politicians such as Angela Davis, Cornel West, and Mickey Michaux Jr. share screen time with Trump supporters, college students on spring break, immigrants, and many more. All of them take Taylor’s deceptively simple titular question seriously, citing ideas like freedom, justice, and equality while trying to define what democracy means to them. But how those broad concepts play out in the real world is often frustrating — and certainly far from the Platonic ideals laid out by academics such as the University of Patras’ Efimia Karakantza and UC Berkeley’s Wendy Brown. And what we learn is that, far too often, “democracy” is used to refer to governments and systems that are actually anything but. MaryAnn Johanson: Astra Taylor’s examination of what might be one of the most cherished concepts of our time is bold, proudly intellectual, decidedly feminist, and, in its perhaps most incisive aspect, skeptical… as in, do we actually cherish democracy, or do we merely pay lip service to it? Do we even understand what the word means and the limitations to which we subject it in practice? Are the flawed ways in which we’ve been deploying democracy in fact responsible for many of the problems of our society? This may be one of the more genuinely provocative documentaries I’ve seen in a while: it’s radical yet keeps itself within a framework that could not be more conservative, looking at the concept of democracy through the lenses of ancient and Enlightenment philosophy. And as it asks us to consider whether we need to rethink our paradigms — especially the ones in which wealth and privilege rule — and create new ones, it does that itself, by featuring mostly women and people of color as its expert talking heads as well as its person-on-the-street opiners. This movie is already walking the walk it is suggesting our culture needs to go on. Marilyn Ferdinand: Canadian documentarian Astra Taylor is a rare bird—a philosophical thinker in an industry that generally glorifies the superficial. Following up her first examination of the “big questions” in 2008’s Examined Life, her latest documentary zeros in on just one question: What Is Democracy?. Her investigation takes her to the birthplace of democracy, Greece, where she meets not only with scholars, but also with the former president of Greece, George A. Papandreou, who imposed austerity measures on his citizens, and Syrian refugees fleeing war and stuck in the stateless purgatory of Greek refugee camps. She also ventures to North Carolina, which one academic classified in 2016 as no longer being a democracy, and to a trauma center and a public park in Miami, a city in which income inequality is particularly egregious and Trumpism battles with liberalism in the minds of its residents. Refreshingly, almost none of the people she questions are white men, which gives this documentary an angle far off the “party line,” which usually revolves around freedom. Of all the answers she gets to her question, the one that stuck with me was from a Syrian teacher living in limbo in a Greek camp. Freedom, he says, is not democracy because we cannot be free to do whatever we want. To him, democracy means justice. What Is Democracy? demonstrates through examples the wisdom of his answer. Loren King At a time when pundits, philosophers and politicians routinely talk about the attacks on democracy all around the world, and when critics of the current US president observe that he regularly runs roughshod over democratic norms, could there be a more vital film right now than What is Democracy? Read full review. Sheila Roberts Astra Taylor’s inspiring documentary, What Is Democracy?, features a diverse cast of ordinary and extraordinary people who explore the meaning of the word, its evolution over the millennia since Plato, its dilution by the forces of modern day free market capitalism, and how personal and local inform the political. What Is Democracy? poses compelling questions that reveal how the concept is increasingly under assault, and that if we truly want to do something about it, we must first define its meaning in today’s world. Taylor argues that the sphere of political relations is much broader than government. It passed through our kitchen, our bedroom, and the community which is a center of social power — meaning that women, in particular, play a critical and insightful role in how democracy is defined. 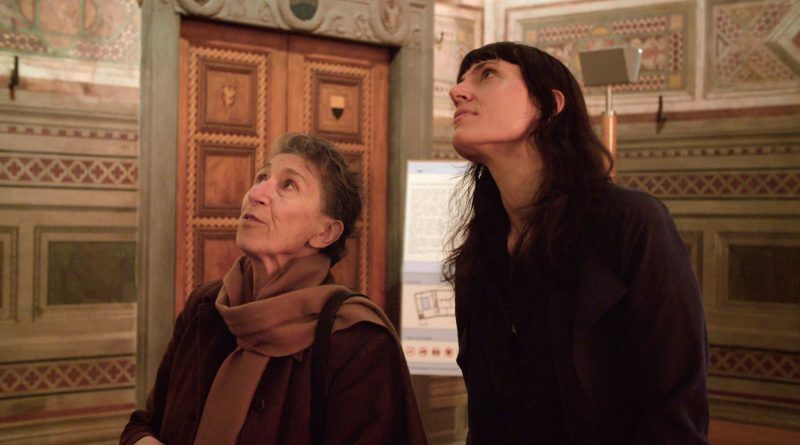 Jennifer Merin Filmmaker Astra Taylor’s timely documentary inquiry digs deep into a concept that we hold dear and consider essential, but might not understand quite as well as we think we do. To trace and explore the meaning of democracy and the way in which the concept has effected society and government from ancient to modern times, Taylor interviews a flowing, seemingly random stream of ‘thinkers,’ including philosophers, historians, politicians, youngsters on the street, immigrants, students, and Angela Davis, among others who explain or opine upon the meaning of democracy. She visits Greece, the Middle East and traverses the USA, stopping at ruins and museums and in school rooms. The film is not an easy watch. Delivering information and insight via the various contradictory comments and interpretations, expressions of varying perceptions and observations, and compilation of personal anecdotes and agonies, it is confounding and astonishing. Put simply, What is Democracy? is a must see eye opener for our time. Sandie Angulo Chen: What Is Democracy? is a fascinating documentary that poses a lot of thought-provoking questions and makes one wonder if we indeed live in a democracy or just thinly veiled oligarchies in slavish service to economic elites. Filmmaker Astra Taylor interviews philosophers, politicians, activists, professors, and students around the world to discuss the issue of democracy and proposes that many western democracies, including (perhaps especially) the United States and Greece, fall short of Plato’s ideal in terms of representation of the people. It’s exactly the sort of documentary that high-school students should see, debate, and discuss both at school and at home with their parents. As the film makes clear, it takes civically engaged voters (and protestors) to make their voices heard and work toward change. 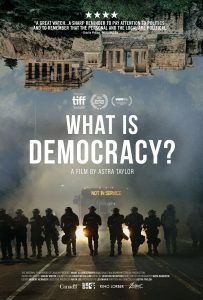 Cate Marquis Director Astra Taylor’s documentary What is Democracy? asks that question by posing it to various people – experts in Greek history, social scientists, academics, ordinary Americans – and comes up with some startling answers. Read full review. Elizabeth Whittemore What is Democracy? could not be coming at more tumultuous time in history. The film explores the past, present, and theorizes what will become of our future if we do not pause to learn from our previous mistakes. The world is in what feels like total upheaval but it is not the first time we as a civilization have been on the precipice of either disaster or triumph. We march, we vote, we are inundated with fake news, and yet the people continue to strive for peace and equality against all odds of capitalism and, dare I say, evil. But democracy goes both ways. That’s the very essence of the word itself. Can good prevail without its counterpart? What is Democracy? should be required viewing in every high school civics class. Hell, it should be required viewing by every human being.